As the wife of A Simple Jew, I am always learning new things. Some time ago, my husband taught me a little something about Rabbi Meyer Baal Haness. About a year ago, I lost one of my precious diamond earrings that my husband bought me as an anniversary gift. Needless to say, I was very distraught over losing it, and for sure, thought it would never be found. My husband assured me that there is a custom of some Jews to recite a midrash three times and promise to give tzedakah in the merit of Rabbi Meyer Baal Haness. With some skepticism, I said the midrash 3 times. Admittedly, I had a tiny smirk on my face, thinking why on earth am I doing this. Afterwards, my husband said he would help look for the earring. (As an aside, ASJ has problems finding just about anything in the house, since I am always the one who organizes and puts things away, so he is usually the one asking me for help.) So, I watched as my husband started to look around for the missing earring. I went upstairs to do something else. Within 5 minutes of beginning his search, ASJ called me downstairs. In his hand, he held my missing earring. It was hidden in a corner on the carpet in the basement. I was totally amazed by his find. Just last night, after a long day, of celebrating with family for my parents 40th anniversary, going to the park with kids, running errands and playing in the yard with our children, I was getting the kids down for bed, when I realized one of earrings was missing from my left ear. This time, it was a pair ASJ bought me for my recent birthday and I was SO upset. I quickly recalled in my mind the midrash I recited from Rabbi Meyer Baal Haness. I ran downstairs to tell ASJ about my lost earring. This time, I thought for sure it would be lost. We had been all over town and I had no idea when I last felt it in my ear. ASJ said he would go outside and look. It was dark outside. We turned on the lights and ASJ looked outside. I proceeded to take care of things in the house. Five minutes later, ASJ called me downstairs. He told me he was sorry and that it was dark outside and hard to see very clearly. But, he said, look in my hand. I looked down and ASJ was holding my lost earring. Truly amazing. I told ASJ afterwards that I had said the midrash he taught me, and he just smiled. Every day, I am thankful to be married to my Simple Jew. I hope this post inspires others to look beyond their usual skepticism and be open minded to the importance of preserving a simple faith. Hey ASJ, Why are you torturing your wife so? We know...you remove the earring when your wife's asleep, then miraculously find it within five minutes of "searching" for it! Thanks for your comment. It would make complete sense, except that I don't wear earrings while I sleep. The Catholics, lehavdil, pray to St. Francis. Wife of ASJ - I can try, can't I? Mother in Israel - if you read carefully, there is no prayer to a human but rather to the G-d of Rabbi Meir. It is a well-known segula, auspicious way of getting Divine Help. I know, but it feels the same to me. I have never heard of Rabbi Meyer Baal Haness, but I will remember him for sure now. Glad such important earrings were found both times. I enjoyed reading your post, wife of ASJ. Most of all, because your love for your husband shines so brightly in it. Thank you, Stacey. Thank G-d, I am a lucky woman. Let me put in a good word for Kollel Chibas Yerushalayim (NY address and phone number shown in the posted photo). This was a major charitable organization through which Jews in southern Poland (Galicia) and nearby areas supported countrymen in Eretz Yisrael. Now, its work continues and is very important to many needy families. And I agree with Stacey -- your love and admiration for your husband come through quite clearly. And the ASJ readers--and friends--know you're a lucky woman indeed. May you always strengthen each other and APPRECIATE each other like this! PS: My wife and I have the same "dynamic" about finding things. I'm usually asking and she's usually doing the finding, with a few memorable rare exceptions! It works fantastic also for Bakashot. About 7 months ago, my husband needed emergency to go to Israel but his passport was missing. He did the Sgula, went to passport main office, and returned within 2 hours with a new passport. please say a prayer for me!! I've searched and searched for the diamond earring I lost last week, given to me by my husband last Christmas. I know it's just an earring but I'm just sick about losing it...I'm not jewish, but could you say a prayer for me? I am so greatfult that you posted the Segula, since I lost for some time now a pair of earrings that I adore, and was a gift, I thus decided to say the segula..and here it is. With Hashem's help I should find them sooner or later!! Have a git yom tov. i lost a valuable ring my husband bought me for a special holiday..I have asked St. Anthony,,..meditated...and just about given up...what is a midrash..I will certainly say it three times....as long as it is good...and God fearing..I am not a jewish person, but that should not matter, we all have one GOD..please help me out..I am at Wits end over this ring..starting to think that I am going crazy.. I searched for my Master card and my ID card for 2 days I turned the house upside down.Then I read that if I said the סגולה לאבידה three times I would find it. And that's exactly what happened. I also read Psalms. I was so happy when I found them that I burst out crying. I didn't forget to give a Tzdaka. Unbelievable. I lost my wallet. Turned the house upside down and couldn't find it. My brother in law told me about the bracha, so I read it, and found my wallet ten minutes later. FREAKY!!! Hello. I have said the prayer three times, and I have found all three things. Twice I found the objects because of shabbos observance - once in the dark on shabbos in my bedroom (don't worry, they were Torah literature). Unlike some of the commentators, it took about three or four months to find two of the items and about a month or two to find the first items. I lost a beautiful diamond bracelet this morning that my husband had given to me for my birthday. I was distraught and spent the whole morning searching for it in the backyard (where I had been with my son) and even left a notice at my daughter's school. I remembered that my mother z"l used to say a bracha and put money in her Rabbi Meir Tzedakah box, but I didnt remember the bracha, so I googled it and found your wonderful blog. I said the bracha and made a mental promise of Tzedakah for a specific sum. I then went out to the backyard and looked again in the grass where I had already searched pretty thoroughly this morning. Within less than a minute, I saw my beautiful bracelet sparkling in the sun between the blades of grass. I actually had shivers up my spine when it happened. It was a real 'Nes'. Thank you Wife of ASJ for helping me to rediscover something that I had forgotten for so many years. I had lost my phone last night and was searching for a whole two hours. I woke up this morning and have been looking for it all day. Finally, i decided its time for a jewish method. A few days ago my friend had told me about Mayer Baal Hannes' bracha but I was skeptical. I had heard about it before, but I am not really religious so of coarse I had my doubts. So i google the bracha which led me to this page. After reading all the comments I said the bracha three times and continued my search. In the beggining i actually had a little faith that it would work, but after looking for ten minutes I began to tell myself "God will never let this bracha work for me, im not religious or holy enough" right then i looked down at a patch of snow that i hadnt kicked (when i was looking for my phone in it earlier" and there it is. I picked it up and it worked like brand new. It had been sitting in the snow and rain all night and day. I think its safe to say im relieved to have found the phone but I feel the bracha working is more exciting and estonighing then the fact that I found my phone. I think I will try to be a better jew and maybe keep alittle shabbat this week. =) Thank you Hashem and Rabbi Mayer Baal Hanes! a month ago i lost my retainer i was looking for it for over 8 hours and i couldn't find it.i decided to try this bracha. 2 hours after i said it i found it. this past shabbos i lost my suit jacket at my friends house. i said this bracha just now again hoping i will find the jacket. I, Dalya, daughter of Mazal and Shalom thank the Holy G-d of Israel and the G-d of Meir Baal Haness and Rabbi Akiva of Franfurt with all my heart and with all my soul and with all my might, blessed be G-d's Holy name Forever and Ever for helping me find my son's car keys. My son phoned me earlier on to say that he had lost his car keys and couldnt find them and was frantic because he didnt have any other spare key for the car (i had told him to make a copy and he never got round to it) and was looking for them for quite a while. I googled prayers for special occasions under: - Finding lost items" and came across this site and read a prayer to the G-d of Meir Baal Haness and then added another prayer to the G-d of Rabbi Akiva of Frankfurt, I then put some money into the charity box and waited for the best. I swear less than 20 minutes had not even gone by and my son called back to say he had found the keys. Miracle! Praise the G-d of Israel forever and ever, merciful and kind to his people. Amen. I was missing my keys, and I had been searching in every possible place for them. I decided to look online for the prayer for finding lost objects, and I came across your posting. I said the tefilla and opened my wallet to get money for tzedakah-and there were my keys! Thank you for providing me with an opportunity to see Hashem in my day to day life! I, Dalya, daughter of Mazal and Shalom thank the Holy G-d of Israel and the G-d of Meir Baal Haness and Rabbi Akiva of Franfurt with all my heart and with all my soul and with all my might, blessed be G-d's Holy name Forever and Ever for helping me find our dog LULY who disappeared yesterday afternoon. 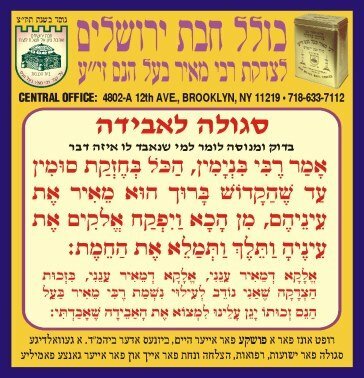 After much search into the late hours of the night, going home very tired, depressed, and sad,I remembered the prayer I had made a few years back, see post for February 15, 2012, and decided to pray for G-d's help, and to ask for the help of the Tzadikim, Rabbi Meir Baal Haness and Rabbi Akiva of Frankfurt. We went to sleep with a heavy heart. On the way for some checkups the following day, around 9.40 am, I get a call from a lady telling me that they had found my dog. I was completely shocked how she knew my name. A few minutes later I get another phone call from my friend who tells me, that they have found my dog! Yes I already know I tell her, where did you hear about it I ask her, so she tells me that this morning she went to get a haircut for her dog, and for a checkup at the vet which she does once a year, both in the same office, and while she was there she asked them if anyone had called in about a missing dog and they said no. Anyway, as she is on her way out, with her dog, she goes to pay the cashier when a phone call comes in with a person enquiring if someone had lost a dog matching my dogs description, my friend who just happened to hear the conversation gets all excited and shouts out, yes,yes, tell them its my friends dog and gave them my number. NOW how is that for a miracle!! Praise the G-d of Israel forever and ever, merciful and kind to his people. Amen. I pray that the G-d of ISRAEL will continue blessing and protecting his people from ALL her enemies. Amen! I would like to express my thankfulness. Upon reading some of the above, I too, could not find my retainer and to replace it is very expensive. I ransacked the house for an entire day. After saying the special words 3 times, approximate 2 hours later, the retainer turned up in the most ridiculous place. How it got there is something I can't even fathom. I'm glad I had the faith to recite some words in both English and Hebrew because...well, it worked for me. Thank you.